But before we get into all of the gripes, let's talk about the good. The music is fantastic. A perfect combination of huge orchestras crashing through epic scenes to delicate acoustic tricks twiddling away over tender moments. While it's a given that music is written for and around the gameplay, it really seems like extra care was taken to perfect the sound to each and every moment. Considering this was Yoko Shimomura's first crack at a Final Fantasy soundtrack, it's even more impressive. These are big games to create a soundtrack for and this is note perfect at every turn. The entire look and aesthetic of the game is really, really slick. Endless desert plains flow into rolling foothills, mountains and cities perfectly, there's no copied pasted texturing to be found and every patch of land looks lovingly crafted. Admittedly, that's 10 years of work put on show but it's impressive all the same. Especially when you take how staggeringly vast the world is. The FMV cutscenes look terrific, although they are quite rare and even the in-game generated scenes are pretty solid. However, all of this detail comes at a cost. It appears that the game will drop it's fidelity in particularly busy places in order to retain a high frame rate. You'll be merrily jogging through a beautiful wilderness until, without warning, everything gets a little less detailed, a little more blotchy and pixelly. This is really noticable and really has an effect on your eyes at points where it continually switches back and forth. I appreciate the need to retain a solid FPS and not have the game look horrifically laggy, but it's a little too much to ask for consumers to swallow such an obvious shift. You can see signs of sacrifices made elsewhere, with water looking generally pretty still and glassy and a lot of really low resolution textures not terribly far in the distance. You can see an example of this below as demonstrated in one of the busier yet more beautiful areas of the game. Fantastic view but many things in the top left are extremely flat and either lacking in detail or looking really muddied. While this isn't a critique as such, it's understandable there's a lot going on, it's still jarring and distracts from the scene. One thing that is truly stand-out is the character models. Every character has every hair, every wrinkle, every pore placed perfectly right. While you might not quite agree with the My Chemical Romance circa The Black Parade style that the main group are going for, they look stunning. 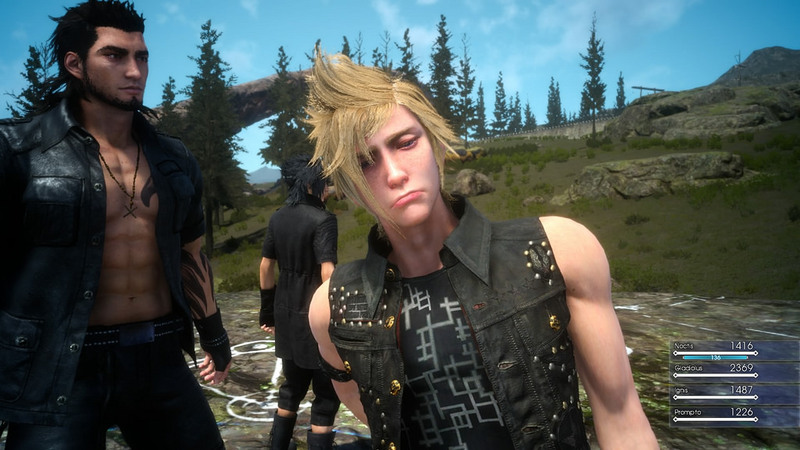 Except Prompto who looks like a ghoul in most of the in-game pictures because his selfie game is apparently weaker than my resolve to complete the game. The progression system is definitely a nice, new take on levelling. You have the ability to 'store' experience points for as long as you wish before resting at places to level up, with the quality of the resting place directly corellating with how much of a boost you get given to your carefully stored points. It's a nice touch giving you a more strategic approach to choosing when and where you level up, as well as providing a push to carry on fighting long after the sun has set and particularly scary nasties come out to play (more on those later). Alongside this, you receive AP (Ability Points) for performing a variety of tasks such as fishing, snapping pictures, cruising in your car and killing enemies in flamboyant fashion. You can then take this AP to put towards various skills and perks to make your life easier and your companions more useful in battle. Or you can improve your ability to get even more AP to spend. There's a wealth of options here to get your teeth into, by end of game, I'd barely filled out half of the choices available. Now, we get onto the less enjoyable aspects of the game. Firstly, the delivery of the story. When it shows up, the story is great. There's some real emotions built up, some truly epic scenes and artfully created tension. 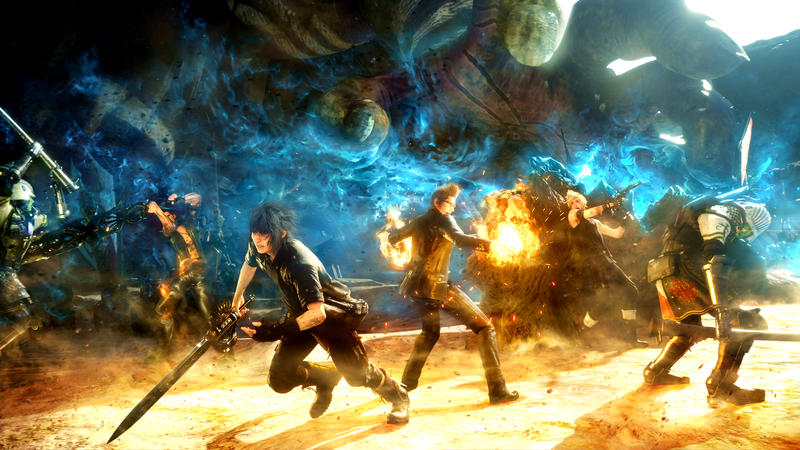 It's everything that a Final Fantasy game should be. 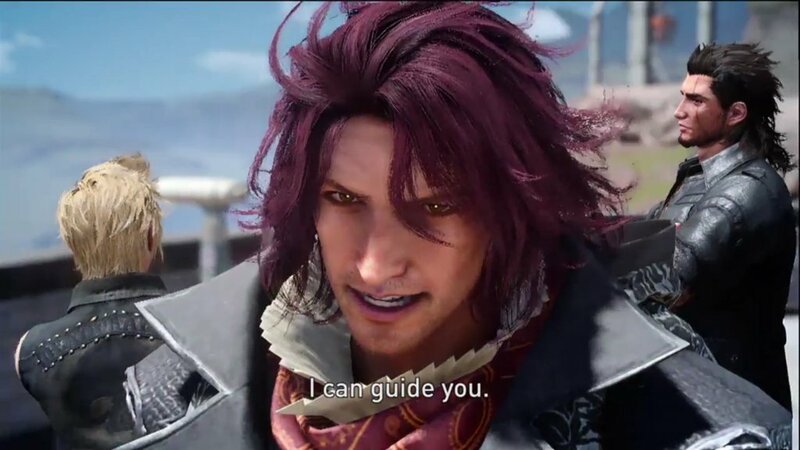 You grow a real attachment to members of your party, perhaps aided by the fact that they are always with you, and you can see how they grow throughout the game. The main sticking point here is that there really isn't too much of it. You are drip fed a few pieces at points early in the game before ploughing through the latter 'half' of the game at a breakneck speed up until the end. Couple this with the fact that there are several points where you are required to almost 'fill in the gaps yourself' for the hows, whys and wheres and the whole thing starts to lose it's edge. Fairly important events are left unfleshed out with some guesswork or perhaps a requirement to buy into Kingsglaive (the companion movie rentable for a further £4.49) to fully grasp. I want to love the story, what there is of it is amazing. I also want more of it, I want to learn about the universe I'm journeying through, I want to know why this person did what they did, I want to learn about their motivations. Instead, I'm left feeling at a loose end, with the barest sketches of reasoning to accompany the fantastic events I just experienced. For the record, I've still not watched Kingsglaive on principle because I feel like asking me to buy into another experience to understand one already priced at £49.99 is a little much to ask. There are also a few bum notes threaded through the story that really create a rub. Without going into spoiler territory, let's say a couple of characters throughout the story have something bad occur to them. However, I hardly know these characters. I'm expected to feel like I want to seek revenge and to have this overflowing sympathy for them when I've barely had time to memorise their name. This isn't good storytelling. Let me learn their favourite colour and their starsign before you do something awful to them and prompt me to care. My emotions, unfortunately, aren't controlled by an on and off switch and require a little foreplay to bring them to the brink. The pacing for the story overall is really off-kilter as well. Instead of slowly being built up to create a wider picture for you, it's thrown out in fits and starts early on, with access to the wide open world being given before any real impetus to explore is delivered by the story. 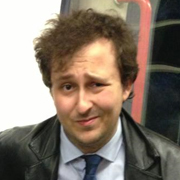 You're given the basic task of 'go drive to meet up with your lucky lady' and then given the world as your oyster. I don't feel like I'm being rewarded for my progress or 'unlocking' much beyond skill points as I progress. 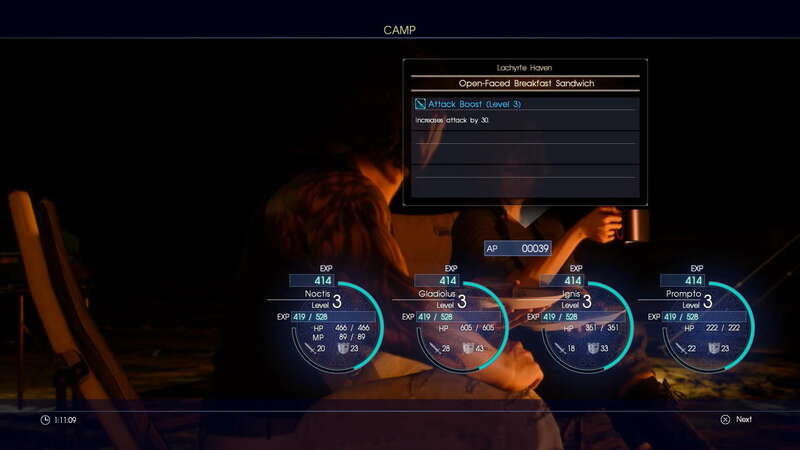 Once you do progress to story heavy territory, your open world is all but slammed shut in your face until you power through the remainder of the game. It just feels wrong. Another sore point is the combat. It's not particularly inspired and easily turns into holding a button to succeed. This may be paired with the fact that it's incredibly easy to overlevel for most content (by the end I was about 10 levels higher than recommended) but it should never be this easy. There are definitely some fights where you take a bit of a beating, but curative items are so plentiful that it's never really an issue. Beyond the curative items, you can also warp your way out of battle at the push of another button which restores your HP at a fair rate as well. 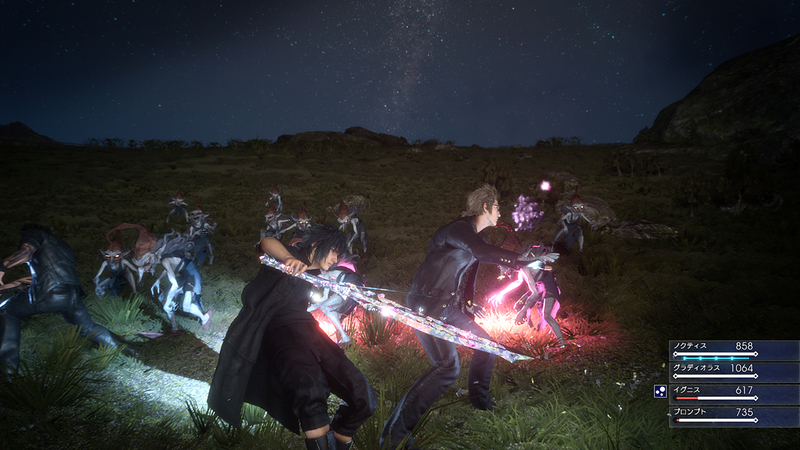 You are given an array of co-op skills to link-up with your allies to do extra damage, however once they're levelled up, these become incredibly powerful and have the ability to floor many enemies before the fight gets going. Taking it a step further, you could unlock an, admittedly difficult to attain, skill that breaks the typical 9999 damage limit and absolute shred through your foes with ease. There are definitely some balance issues that could well have been ironed out over a decade of development. You are also given the option of crafting magic skills for your party to utilise. Magic has always been a mainstay of the Final Fantasy series, but in this one they are almost utterly useless. You throw them at your enemies like a bomb, creating a huge AOE hit, which is also affects party members with whichever damage and status effects you've bound into them. Give them to your allies to be used and they will almost definitely hit you with them mid battle. Use them yourself, you will almost certainly hit a couple of your allies as much as you will your opponent. I used magic a handful of times during my playthrough to try it out and to see if I could improve how I used it at all. I couldn't mainly due to it being effectively impossible. This is combined with the fact that there are very few enemies that have enough of a noticeable elemental weakness to make it worth your while switching to magic as opposed to changing to an alternate weapon that is just as effective against them. My next point might be a personal gripe as opposed to a genuine flaw, but I'll allow you to be the judge of it. 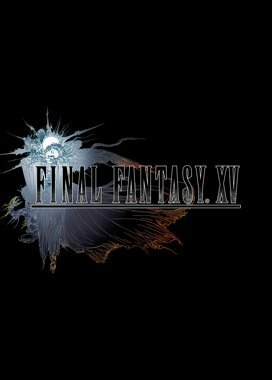 FFXV contains a day-night cycle, this gives you between the hours of 6am and 8pm to cavort around in the world as you see fit. Once night time arrives, huge and powerful 'daemons' begin to spawn everywhere on the map, making it almost impossible to move around during the evening before you've reached around level 30 or so. You are effectively forced to sleep for the night (spending your carefully saved exp in the process) and are no longer able to fast travel to anywhere. These nasties even spawn on the main roads, so even slow travel is effectively ruled out. I like the idea of changing up enemy spawn pools between two different times, it adds an interesting and exciting element to the game. However, let me go and quickly hand a quest or two in. Let me choose where I want to rest for the night. At least give a method of moving around the map to make those last few choices before sleep when the clock has gotten away from you. These especially horrible beasts hate light, so why not allow my car's headlights to be enough to ward them off as I zoom around the roads? This brings us nicely onto the driving and travel. Your car reaches blisteringly top speeds that would make a snail slightly jealous. 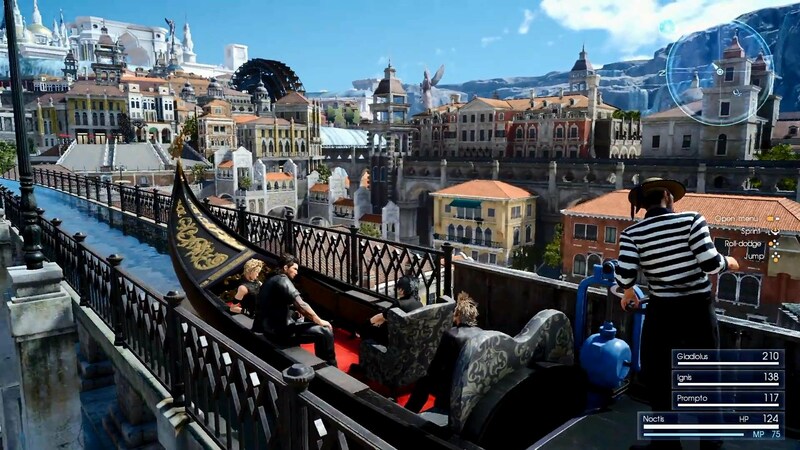 At the start of the game, you bumble around in your car taking an age to get anywhere and that's great for checking out the sights. Once you've drank in the scenery a few times though, they become monotonous and just feel like padding for the game timer. There's only so many times you'll want to hop out the car to check out a shining treasure in the distance and they definitely don't measure up against the hours you'll spend on autopilot from place to place. 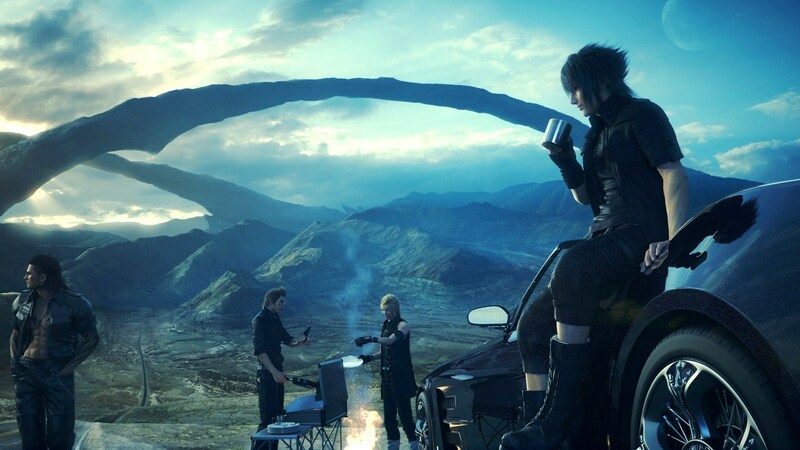 You can upgrade your car's speed by completing an array of side quests, but even after completion, you're still looking at 3-5 minute journeys each time to move from location to location. You do have a fast travel mechanic to navigate straight to specific parking spots (which aren't always necessarily where you want to go), but the loading screens between areas can get as high as a minute and a half at times, with a minute being reasonably typical. This doesn't create a great environment to urge me to explore or to make me complete one more side quest. It makes me want to reach for the power button. Finally, my biggest gripe of the game and you may wish to skip the next couple of paragraphs if you want to be utterly and entirely spoiler free. I'll do my best to be as vague as possible while still conveying the point and won't be giving any real plot points away. At a stage late into the game, I put my controller down and tweeted that I was done with the game. I was already a little unimpressed with the flow of the story but was persevering to see where it all went. I ultimately finished the game because I wanted to write this review but... Imagine learning all of the mechanics, then having them all stripped away from combat. Imagine having no interaction with your companions for a couple hours. Add onto this a maze-y corridor simulator, somewhat similar to the lacklustre experience in Final Fantasy XIII with jump scares, back tracking, switches and inane puzzles to boot. Yup, that's what you get near the climax of the game. Now, admittedly, this serves a storytelling purpose. There's a reason for these things happening and I accept this being part of the story. However, there are ways of expressing this without introducing some of the most boring and unsatisfying gameplay I've encountered in years. Running aimlessly down corridors while fighting carbon copies of the same enemies over and over with a limited skillset is not my idea of a fun experience or a compelling reason to carry on. It's an inexcusable break in an otherwise servicable experience and I can't imagine the logic behind it. I nearly wrote that I was wrong about this game, so very nearly. Despite my extreme pessimism around the title, for a long time it was showing me promise, some interesting mechanics and a little hope. This was all until it took all of it's gains and dashed them on the ground shortly before the end. It's impressive in a way I suppose. 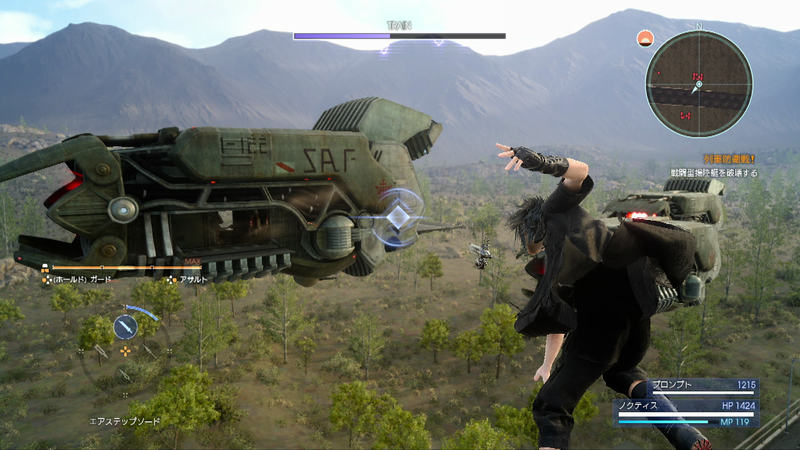 For the uninitiated, Final Fantasy games are a bit of grand tradition now. Fantastical universes, enormous stories of epic proportions and hilariously oversized weaponry are the mainstays. This one is no exception (except perhaps the story, which we'll get to later) and delivers an enormous world 10 years in the making. Originally, this was intended to fall within the XIII (13) universe but was changed to being it's own beast after, presumably, the comparative flop that universe and it's sequels became. The rough gist of the story is that you are a prince on your way to meet your lady love in order to finally marry her and bring great joy to the world. You are journeying through the sprawling map with your retinue of lovable scamps, inexplicably doing odd jobs for folks along the way to this meet up. 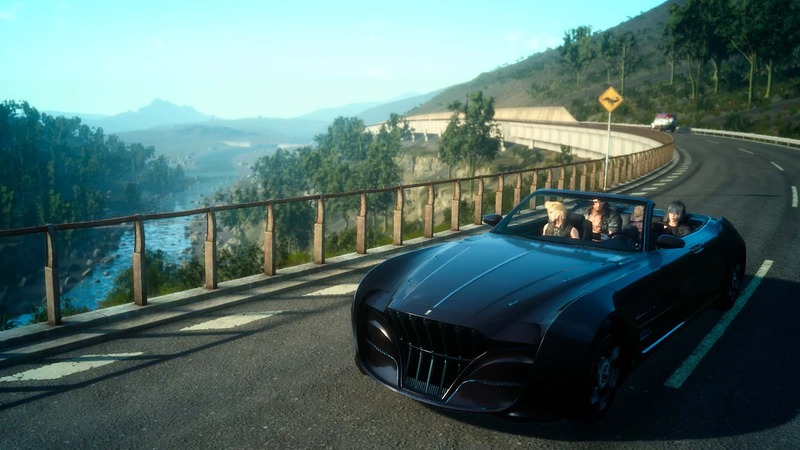 Also, you have a sweet ride in the form of the Regalia, your car, which you can use to zip around the map from point to point. You can even buy a Regalia-like in the real world in the form of the Jaguar S-Type. Oh goodie! You were close, so very close to being good. Ultimately, the game is pretty fun in places but drops off when it's away from it's high spots. When it's good, it's fantastic, for the other 80% of the time, it's mediocre at best. Not sure how our review scores work? Check out our Review Policy on how we review games.